CDI professionals working to help the appeal process need to make sure they have all supporting documents previously collected, immediately available. This ensures that all potential counterarguments are considered and increases the efficiency of the creative process. Trip after trip to the bookshelf, to the computer, to the copier, to the printer, or to a col­laborator’s desk serves only to slow down and distract from accomplishing the stated task. Additionally, set aside sufficient time to construct the appeal letter before getting started. Interruptions to the creative process are damaging (if not frustrating) and can lead to lower-quality work. In other words, if 20 minutes remain before the start of an hour-long hospital committee meeting, wait until that meeting is over before becoming engrossed in all the reasons the denial is incorrect. For the actual letter structure itself, develop a general appeal letter format or template and stick with it. Appeals will occur with a large enough frequency to warrant this approach. Having to expend effort only on constructing the individual counterarguments in any given letter will save both time and energy. The more aspects of an appeal letter that can be systematized or transcribed into other appeal letters, the more time is available to ensure the appeal is won and that the auditor/payer cannot exploit that crack in the hospital’s defenses again in the future. When constructing an argument in the body of the appeal letter, be sure to cite from exactly what source or sources that argument is drawn. The physical copies of those sources that will be faxed or mailed with the appeal letter must then be conspicuously highlighted or underlined at the specific sections of text that corroborate that argument. (Remember that highlighting does not trans­mit through faxes, as facsimile machines almost universally print in black and white only.) This highlighting or underlining must be done, as the auditor/payer cannot be trusted to find those portions of the text on his or her own. Not surprisingly, numerous sources have speculated that evidentiary citations received by audi­tors that do not have the critical elements highlighted or underlined frequently end up in the recycle bin without any review or consideration. For every coun­terargument made in an appeal letter as to why the claim denial is wrong, these steps must be repeated. Occasionally, it may seem as if the entire medical record must be sent again. However, if that is what it takes to win an appeal, that is what should be done. 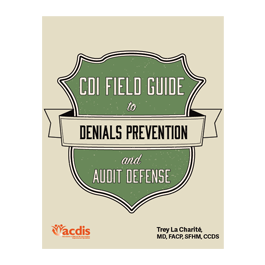 Editor’s note: This article is an excerpt from the CDI Field Guide to Denial Prevention and Audit Defense.